nextlive next April 1, 2015 9:59 a.m.
That's the promise of a high-end new facial treatment. In a tiny room inside an Upper East Side dermatologist's office, I'm attempting to regain my youth. Or, at the very least, look better. I've come to try the HydraFacial, a multistep treatment that promises to erase wrinkles, reverse sun damage, lighten dark spots, and prevent acne. All of these transformations come from one key innovation — using stem cells from an infant's foreskin to trick skin into behaving young again. Why foreskin? Dr. Gail Naughton, a leader in regenerative science — she developed technology to grow human tissues and organs outside the body — explains it this way: When we're born, our skin is in its best shape. Our cells naturally secrete proteins known as growth factors "that keep the cells healthy and stimulate them to divide," Naughton says. As we age, our cells divide at a slower rate, which contribute to the telltale signs of aging, like wrinkles and loss of firmness and luminosity. Growth factors captured from the donated foreskin of a baby (just one can generate over a million treatments) are at their peak ability in promoting rapid cell turnover. Applied topically, they spur adult skin cells to regenerate. This is said to have a smoothing effect on the skin. I'm here to see if the process actually works — specifically, on my nasolabial folds, the hereditary creases that stretch from my nose to my mouth. I'm told that three HydraFacial treatments will smooth the creases into near invisibility. There are five parts to the HydraFacial. My skin is first wiped clean with a cleanser and then treated with a salicylic-and-glycolic-acid peel using a giant machine that looks like a cousin of R2D2. This is the HydraFacial machine, a fully equipped device with tiny suction tubes as arms and bottles of facial-treatment mixtures attached at the belly. The salicylic and glycolic acids, like micro sandblasters, sweep away dead cells lingering on the surface of skin. The chemicals are a lightweight goop that feels cool on my face. Zahra, my esthetician, keeps asking me if I feel any tingling on my skin. I don't — but she tells me that most people feel a slight burning sensation at this point. Must be my thick skin. Next up is the extraction step. The tube that deposited the peel now works in reverse and becomes a micro vacuum cleaner. Blackheads and flaky skin are swept up in what feel (and looks) like the suction tube from a dentist's chair. It's an odd but not unpleasant feeling. I can actually see tiny deposits of my skin now swirling around in the extraction cup. Gross, but also kind of cool. After my pores are cleared, a blend of skin-nourishing antioxidants and hydrating hyaluronic acid is smeared over my face. Here's where the foreskin extracts come in — they're smeared on, too. The growth factors from the foreskin stem cells don't feel different than any other serum as the esthetician applies them to my face. The final step of the facial is a quick, light therapy session, where a blue and red LED light targets oily skin, fine lines, and hyperpigmentation. 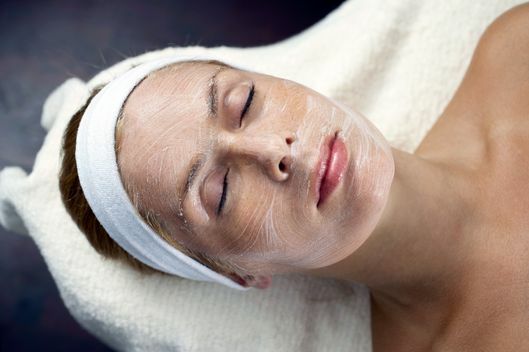 In all, the entire facial lasts 30 minutes and induces not the faintest trace of redness or irritation. Of course when it comes to facials, the proof is in the mirror. My skin glows in a way that I thought only Jennifer Lopez could glow. Fresh from the facial, I saunter into a photo shoot wearing no makeup because my confidence is at Beyoncé levels. My nasolabial folds are still visible, although a bit less pronounced now. (Presumably, two more treatments would help even more.) And a part of me feels like a Disney evil queen, draining youth from a newborn for a few weeks of a restored complexion. Is this the future of facials? And if so, is it wrong that I want more?